Your Merzouga Desert Tour will take us in the morning from Marrakech by 4×4 to Ouarzazate, crossing the High Atlas mountains and the pass of Tizi-n-Tichka (2260m). At panoramic viewpoints, there will opportunities to stop and take photos. Later there is a stop to visit the Kasbah of Telouet, which once served as a palatial residence and as the headquarters of the powerful Glaoui tribe. A side road crossing the Oumila Valley leads to the Kasbah of Ait Ben Haddou where lunch will be served. In the afternoon, a visit to the Kasbah itself is scheduled, before continuing to Ouarzazate for the night. Morning departure to the Toudra Gorges, passing the Oasis of Skoura, where numerous ancient Kasbahs, some sadly in ruins, stand amongst the palm trees. From here, your Merzouga Desert Tour takes you through Kela’a M’gouna, the Valley of Roses, to the Dades Gorges. It is here that lunch is planned and, in the afternoon, a continuation of the trip to the Toudra Gorge for the first night. After breakfast there is time for a leisurely walk in the Tinghir palm grove, before driving to the Merzouga dunes via the Ziz Valley, the Oasis of Tafilalet, stopping in Erfoud or Rissani on the way for lunch. Having arrived in Merzouga, in the course of the afternoon there is time to take a camel ride for a couple of hours and ascend the Erg Chebbi dunes to watch the sunset from the summit (250m). After sunset, the night will be spent in a nomad tent, which is also the venue for dinner. If you wake up early enough, you can watch the spectacle of the sunrise, when the colour of the dunes and the play of shadows are an awesome sight. The return to Merzouga on camel back takes about two hours. Once there, it is possible to freshen up under a shower at a local hotel. The itinerary of your Merzouga Desert Tour continues to the Dra’a Valley via the village of Tazzarine (featured in the film ‘Babel’), and on the N’Qob for lunch. 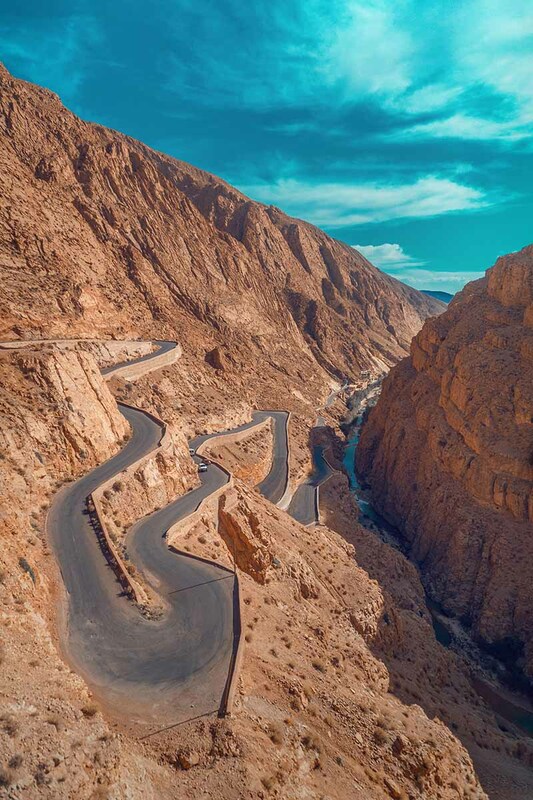 In the afternoon the journey takes us to Tanasikht, to drive along the ancient caravan route to discover the real Dra’a Valley, with its huge palm trees and ancient villages. At the end of the afternoon, the Kasbah of Tamnougalte offers dinner and a night’s rest. After breakfast there will be a visit to the Kasbah itself before returning to Ouarzazate, via the mountain pass of Tizi-n-Tinfifte (1660m). Once in Ouarzazate, we visit the Kasbah of Taourirt, originally the residence of the Pasha of Marrakech and a symbol of the feudal period of the lords of Atlas. Afterwards, an unpaved track to the Fint Oasis nestling among the mountains, which once served as the crossroads of caravans, provides a hidden delight. The return to Marrakech will complete your Merzouga Desert Tour at the end of the afternoon.